After the Jug Was Broken: "Weave the Tree of Life!" "Weave the Tree of Life!" 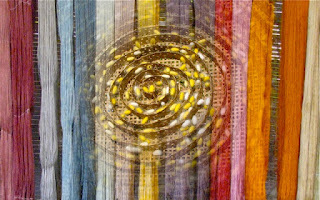 "Weave the Tree of Life"
I had been looking for weavers and finding such extraordinary craft woven by women in remote Laotian villages, women weaving sacred symbols & sacred animals and small Buddhist spirits into Rothko-like hangings. The weaving school we visited had handspun hand-dyed silk in colors I didn't know you could get from plants, and the work had patterns that involved the skill of masters. Wait. I forgot to mention that I am a weaver - even when I'm not actually weaving. 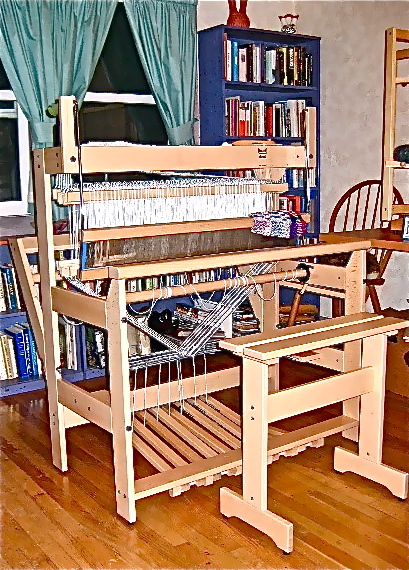 I have a remarkable Dutch loom that I bought after I retired from teaching, thinking now Now! I will be able to continue what began in 1965, when I studied weaving with Kay Sekimachi, (who would be a National Treasure if we had such a title.) 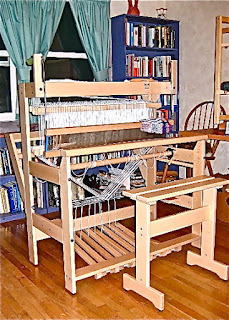 I bought a small loom, and then I became a grad student and later a full-time prof, and I said "When I retire I will return to weaving. And I will write poetry." But I haven't been weaving. 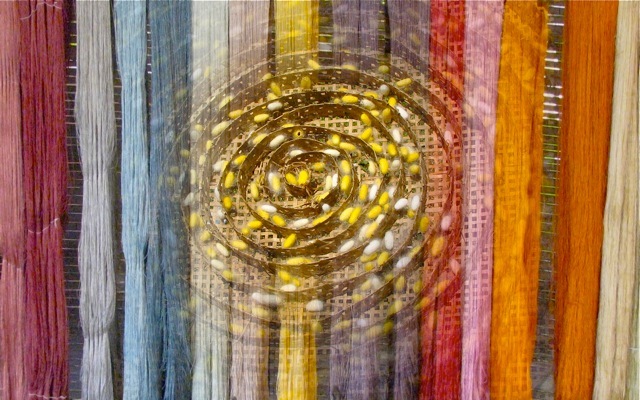 I set up and threaded the complex loom and began an experiment to weave tapestries using different size yarns without a rough line between colors and shapes - but the Muse stepped in. "Poetry" she whispered while I was reading the manual that came with the loom. "Poetry" she said aloud as I was threading it. "Poetry" she yelled perched on my laptop when I went to check my email. Hadn't I retired to write? she demanded. Portrait of the Inner Voice as a Nag! Finally she used her heaviest weapon - she sent me first lines and last lines in my dreams and during my morning walk. The Muse accompanied me to Africa & India. She was perfectly willing to lend her voice to the goddesses and spirits I encountered. When I returned I was Writing Writing sending out poems for publication and Writing. I became a mentor at a high school (weave what you know into a new setting) but still Writing Writing. Seeing friends and arranging events. Always an activist. Always connecting to family. But mainly? Poetry. Write. Join a Writing Group of wonderful talented women. Collaborate with Bill - his art/my words. Present our work. Weave our families together. Write Write. Prepare a manuscript published by Fisher King Press & Read Read in public. Start writing a blog. Read Jung’s Red Book and write poems in response. Write about a friend’s art. Connect with a spiritual community. Join a Facebook community and learn an Amazing Amount. Now I plan to go to the Congress of Women for Future Generation where a weaving of women will write a Bill of Rights for our descendants. I work on a book of poems by poets who write about Change write about Now about Connection. Write my own poems for this book and the Muse becomes Gaia - Gaia becomes Muse. Oh I know this may not be enough of an excuse. I know the voice said "Weave the Tree of Life" - but you know? I have been. Writers are weavers, aren't we? I don't think I'd thought of it in exactly those terms before, but you're right--that is what we do. I wonder if this is why when I'm writing I often notice exquisite webs made by orb weaver spiders outside my studio window. Perhaps the spiders are weaving encouragement! Beautiful post, my friend. Are we sisters in spiders? When I take a break from writing, I leave my deck and walk around to the garden where the orb weavers are working. Of course - it's all weaving! Hadn't thought of that. Thanks for comment.